'Sherlock' star Benedict Cumberbatch is now one of Hollywood's hottest properties. Not only has he lent his rather impressive voice to Smaug the dragon in 'The Hobbit: An Unexpected Journey', he's playing the mysterious new villain in 'Star Trek into Darkness'. It's a follow-up to J.J. Abram's smash-hit reboot of the venerable sci-fi franchise, and sees the very British star play 'John Harrison'; terrorist, hand-to-hand combat expert and all round evil b****d.
Of course, he may not be 'Harrison' at all. Internet rumour-mongers have persistently insisted that he is none other than Khan, the genetically-engineered tyrant first played by Ricardo Montalban in 'Star Trek II: The Wrath of Khan'. Even the origin of the name suggests something fishy is afoot. 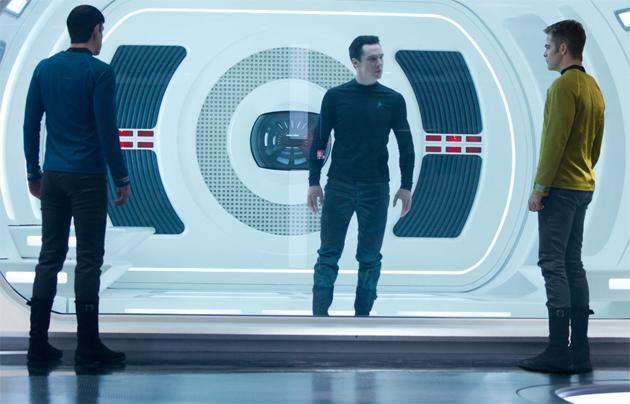 John Harrison isn't an unknown in the 'Star Trek' universe. In 'Space Seed', an episode form the original 1967 series, Harrison was nearly suffocated on board the Enterprise by none other than Khan Noonien Singh himself. The film has further parallels with the first 'Trek' sequel. 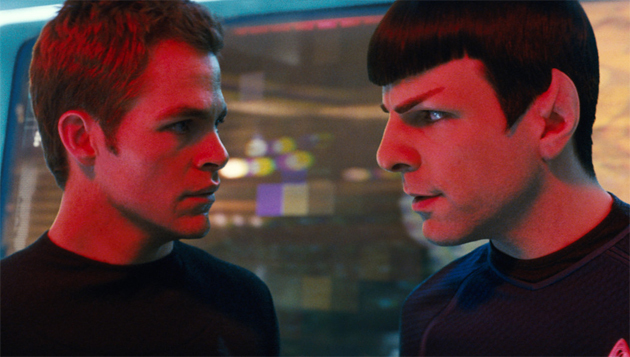 In nine minutes of preview footage shown to journalists, we saw Spock repeat a very famous line from 'Wrath'. The brainbox geneticist from that film, Dr. Carol Marcus, is also back and now being played by Alice Eve. "He is fed into the crew of the Enterprise and creates a lot of shadow play between Kirk and Spock. He is an awesome single-handed weapon of mass destruction but also a master mind-player and manipulator who plays with their roles and loyalties and understanding of what's right and wrong. As far as his own purpose, beyond the terrorist means, he has a noble cause, which will hopefully resonate with the audience." That's cleared that up then. One thing we do now know, he filmed a homemade audition tape for the role on his iPhone. Interestingly, producer Bryan Burk was also at the event and said he was glad the sequel had a stronger villain this time round. Nero, the antagonist in 'Star Trek' played by Eric Bana, was felt to many to be lightweight, and was only given a few minutes of screen time. "The villain in this movie is a significantly stronger role," said Burk. Cumberbatch was diplomatic when told about the comparison. "It's a compliment to me, not a disservice to Eric Bana… I think what he was saying is that second time round you've established the origin story there. All the crew understand each other, but at the same time you have to up the stakes with their peril, which means bringing in a stronger antagonist. It's one of hugest compliments [J.J. Abrams] wanting to work with me, knowing how big this villain is." Eve also couldn't add much about Dr. Marcus, but did expand on how he influences Captain Kirk's narrative arc this time. Chris Pine plays the iconic Star Fleet captain in a role made famous by William Shatner. She said: "What happens in the first film is that Kirk is given his captaincy, but by the second film he maybe is wielding that power thoughtlessly. Spock and Bones are satellites of his ego and they represent a morality and a logic that he is lacking. My character is bossy and knows things and he is maybe not wanting to here the truth. His journey is a journey of humbling oneself. A journey of pathos." Cumberbatch agrees: "In the first film you see Kirk as a teenager becoming a young man, earning the chair and the respect of his peers, but this is about something beyond that; caring for his whole crew and becoming a father to them." He said Pine gives a "grown-up" performance this time around. Despite a similar budget to the first film, we're promised 'Into Darkness' will feel significantly more expansive than its predecessor, with 40 minutes now filmed in IMAX. They've also pushed the 3D conversion process "beyond its limits" according to Bryan. An early scene we saw that showed Kirk and Bones (Karl Urban) running away from alien tribesmen amongst bright red vegetation used the format impressively. Several audience members (not us, obviously) ducked as arrows sped towards the screen. "J.J. Abrams is like Michelangelo playing with the tools of our cinematic renaissance" said a clearly impressed Cumberbatch. "It's an incredible new canvas that he's stretched for this film." Some might hope however that 'Into Darkness' bombs — so Cumberbatch does not become too famous to keep playing Sherlock Holmes in the masterful BBC series. 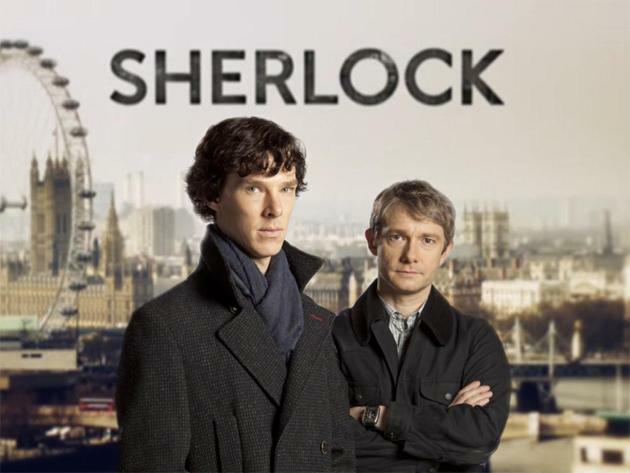 Will he ever get too big for 'Sherlock'? "No! Absolutely not," he said. "I don't think that's a possibility because I love it to much. Making [Sherlock] is all about availability. Martin Freeman [who plays Watson] has the same kind of pressures on him now. It's a thing of quality not quantity that show - thank god. We started young with it. We started when they meet and we still are young for those roles. There's no reason why it can't continue until we get too old." 'Star Trek into Darkness' is released in the UK on 17 May 2013.